My Outside Voice: Meal Plan Monday! Busy holiday week of course, but we are hoping to finish up some shopping, get some wrapping done, and stay organized! Friday - Mom is making chicken and wild rice, I am making a mushroom bisque and we have a lot of appetizer type food. Saturday - The boy and I will be going to my parents for brunch and then the boy and I will have Christmas dinner at our house. We haven't decided what to make yet, but I will be finalizing the menu this week. Sunday - Boxing Day open house at our Canadian friends, dinner at the boys parents to exchange gifts. 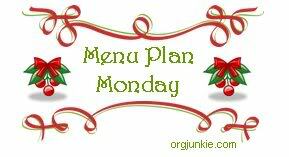 For more meal plans and links to great recipes, check out the Orgjunkie.